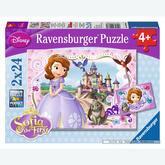 Disney Sofia the First There is 1 product. A 24 pieces jigsaw puzzle made by Ravensburger (reference 090860). Size: 26 x 18 cm (= 10.2 x 7.1 inch). Special series: Disney Sofia the First.